Wing Twist On Wire Connectors are suitable to meet the requirements for both commercial or residential applications. A wire coiled spring is found within the tough plastic shell of the Wing Twist On Wire Connector and expands to accommodate a wide range of wire combinations, sealing out moisture and protecting conductors from corrosion and fungus. The Wing Twist On Wire Connectors cover common wire ranges and are designed with a ribbed cap for fast and easy installation. The wings on the outside of the Wing Twist On Connectors provide extra torque required in some applications. 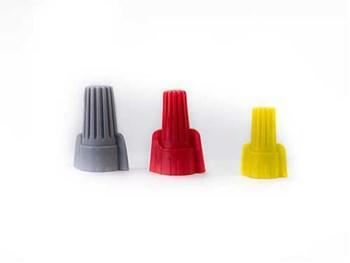 Wing Twist On Wire Connectors from Cable Tie Express are available in Yellow, Red, Gray, and Blue. These Connectors are available in bags of 100 or 1000 pieces.